Group 13 contains the most essential adjustment and replacement procedures required for ordinary servicing of bodies. These procedures may be performed by any competent mechanic without specialized experience in body repair work, and may be accomplished with tools and equipment usually available in a service shop. Refinishing, repairs to 1952 Buick body panels, and replacement of body panels are not covered in this Group. See paragraph 12-5 for repairs to Series 40 rear quarter side outer panel (rear f ender). Complete identification of each 1952 Buick body as required for service is provided by a plate riveted to the cowl on right side under the hood. See figure 13-1. This plate should never be destroyed; if removed during body repairs it should be reinstalled in original location. The Style Number is a combination of the model year, car division number, and actual style number of body. 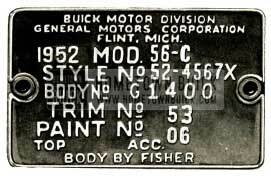 In figure 13-1, 52 represents the model year 1952, 45 indicates Buick Division; 67 indicates the body style. An X following the style number indicates that body is equipped with the Hydro-Lectric Power System. 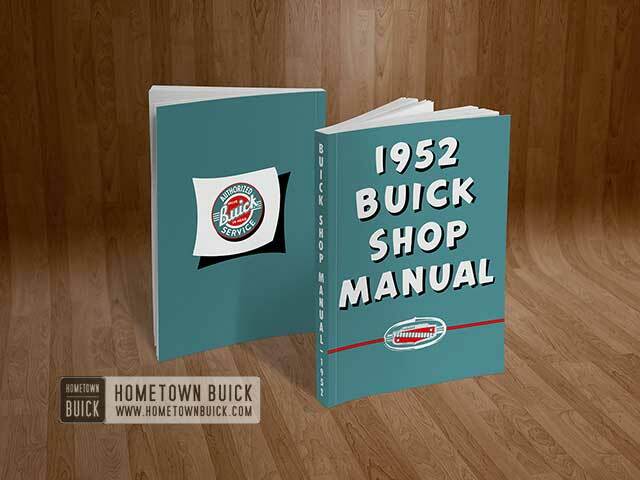 The 1952 Buick Body Number is the production serial number of the 1952 Buick body. The prefix G denotes the plant in which body was built. Sand entire 1952 Buick body to smooth out rough spots and insure proper adhesion of new finish. Spray or brush all wood parts with three coats of DuPont Clear Dulux RA-190. Allow 15 hours drying time between coats. When refinished areas are thoroughly dried, sparingly wax entire 1952 Buick body. Chrome plated parts rust or corrode because chemical agents present in road silt and traffic film seep through pores in the plating and attack the underlying base metal. A plating of nickel is usually applied underneath the chrome to seal the plating and protect the base metal. Because of current restrictions on use of this scarce metal, some chrome plated parts may be sealed instead by a clear baked enamel coating over the chrome. Deterioration of chrome plated parts, whether enameled or not, can be avoided by keeping the parts clean and by periodic application of a preservative which will aid in retarding seepage of destructive agents through the plating. Plated parts should be washed with clear water only, using a mild detergent such as Du Pont Car Wash when necessary. Do not use scouring powders, cleaning compounds, or stiff brushes. An application of Buick Chrome Preservative (group 8.800) every thirty days as instructed on the container will materially aid in maintaining lustre and retarding deterioration of chrome plated parts. Repairs to scratches or abrasions on enameled chrome plated parts must be performed within a reasonable time to prevent further damage to the finish. If damage to the enameled surface is extensive enough to require feathering the edges in order to insure a presentable repair, use a small amount of Rotten Stone (cake or powder) on a wet cloth or felt. Do not use sand paper, rubbing compound, or other abrasive as damage to the plating will result. Clean damaged area with naptha or “PrepSol,” then spray or brush on two coats of DuPont #1234 Clear, available at all DuPont jobbers. IMPORTANT: Be sure to properly mask all chrome plated parts before spraying refinishing materials on sheet metal or body. Any cleaner used to remove overspray will also remove the enamel from chrome plated parts. Do not use any gasoline which is colored or which contains tetraethyllead. Do not use volatile fire extinguisher fluid. To clean 1952 Buick top, brush with whisk broom to remove dust. Most dirt spots can be readily rubbed off with a piece of crude rubber or art gum. If necessary, the top may then be thoroughly cleaned with mild soap and lukewarm water. If, after drying thoroughly, any spots still remain, they may be removed with ordinary gasoline (not Ethyl), naphtha, carbon tetrachloride or Carbona. These cleaning agents should be applied very lightly. Do not soak the material. Many different compounds are used as cements and sealers in the construction of a 1952 Buick body, and many different brands are available for service use. It would not be practical to stock all of the compounds used, or to discuss here all of the brands available. This colored adhesive is used for cementing trim fabrics to metal panels, trunk linings, floor carpets, etc. It is especially developed to adhere to fabrics without bleeding through to cause discoloration. This cement has the “quick tack” and “wet” strength required to permit cementing the fabrics in place quickly and securely. It may be used to cement “Soundsorber” to the deadener pad on the underside of the roof panel. This semi-heavy black compound is a flexible rubber sealer for general use in sealing welded seams inside the 1952 Buick body. It is also used for sealing body moldings. It is non-drying and its ability to stay in place without flowing makes this sealer useful for many purposes. This sealer is a sprayable black coating for use on metal surfaces underneath the 1952 Buick body. It is especially useful for sealing all welded seams and crevices against entrance of dust and water. It also acts as an insulator against noise and extremes of temperature. This compound is a pliable, waterproof, non-shrinking, non-hardening putty-like compound used for sealing out moisture and dust in seams and crevices. Can be molded by hand to any shape or form for easy application. Ideally suited for wood station wagon bodies and for hard to get at places on the steel underbody. Can be formed or rolled into “pig tails” and pressed down into crevices with the fingers to make a satisfactory seal. This sealer is used for sealing all pipe connections in the Hydro-Lectric power system. It is available in 1/4 pint glass containers. At each closed body mounting point a rubber shim is placed between the 1952 Buick body and frame, a rubber insulator washer is placed under the frame side rail flange or hanger, and flat steel washers and a tubular spacer limit compression of the rubber parts to a predetermined amount as the body bolt is tightened. See figure 13-2. This form of mounting eliminates metal-to-metal transmission of road and chassis noise into the 1952 Buick body. At each convertible coupe mounting point a solid composition shim is placed between the 1952 Buick body and the frame, and a flat washer and bolt anchors the 1952 Buick body to the frame. See figure 13-2. 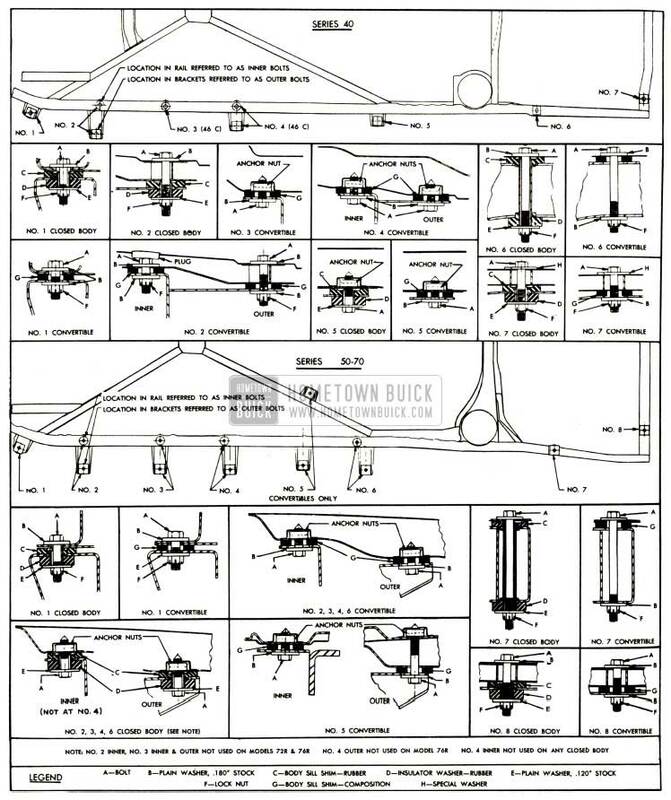 In addition to the parts shown in figure 13-2, steel shims are added as required at individual mountings to compensate for variations in body and frame in order to insure a firm mounting without distortion of 1952 Buick body. Whenever it becomes necessary to remove body mountings, care must be taken to reinstall all of the mounting parts and steel shims in their exact original positions. Closed bodies should not be re-shimmed to correct distortion of door openings. These openings should be shaped as required by the use of body jacks. The 1952 Buick body should rest firmly on all mountings before bolts are tightened and steel shims should be added where 1952 Buick body does not contact a mounting. Shims for this purpose are furnished under group 4.023. Convertible bodies may be re-shimmed in cases where door locks do not latch securely after door is properly adjusted in body opening (par. 13-7). In such cases, shims placed under the ends of body will close in the body door opening sufficiently to insure proper latching of door locks. When 1952 Buick body bolts are tightened use a torque wrench to tighten all bolts uniformly to 25-30 ft. lbs. torque. The specified torque is very necessary to insure proper compression of convertible body mounting shims, and to insure tightening against the spacers in closed body mountings. Excessive tightening must be avoided as distortion of mountings will result.